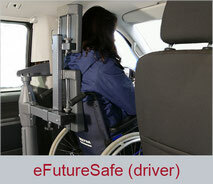 The FutureSafe head and backrest ensures maximum safety for wheelchair users. Like every other passenger or driver in a vehicle, wheelchair users should be adequately protected from the consequences of an accident by the use of a headrest and a sturdy backrest. 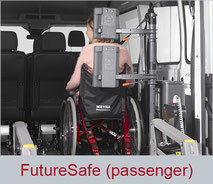 FutureSafe is a patented safety system that is used together with a wheelchair bracing point on the floor of the vehicle. The eFutureSafe offers those who drive themselves a fully automatic version of the head and backrest, operated via a switch on the dashboard. Here too the position of the headrest and backrest can be separately adjusted to suit the wheelchair user.